Life jackets recovered during MSF search and rescue operations on the deck of the Bourbon Argos. The lifejacket pictured here belonged to one of more than 16,000 people rescued on the Mediterranean Sea by Doctors Without Borders/Médecins Sans Frontières (MSF) teams since May. 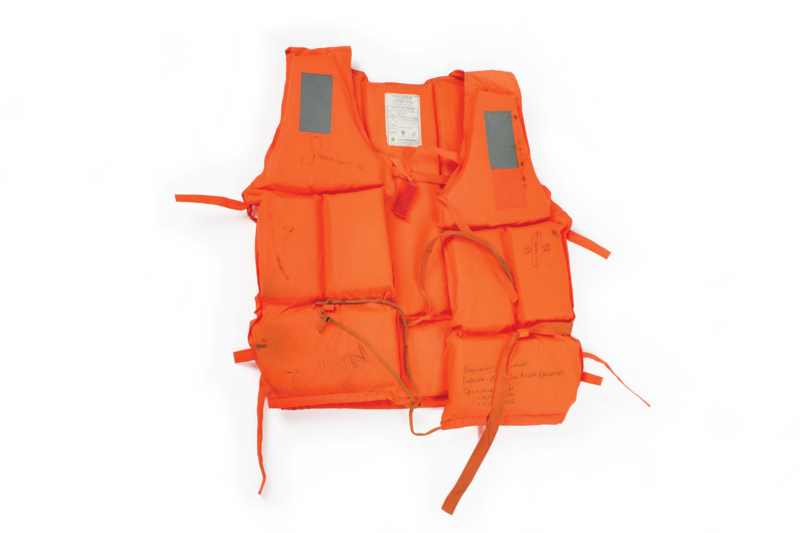 This lifejacket, and the person who wore it, are symbols not only of a chaotic and dangerous world, but also of the failure of United Nations member states to meet their obligations to care for, extend safe passage to, and consider the asylum claims of those who fear for their safety from violence and oppression. People don’t abandon their homes because they want to, and they know the risks they will face on their journeys. It is out of desperation that they flee war and torture, misery, poverty, and persecution. While delivering emergency medical care across a wide range of countries and continents, Doctors Without Borders sees firsthand the horrific conditions and suffering that drive people to risk their lives for the chance of a better and safer future. In northern Jordan, for example, which only a lucky few of the Syrians wounded daily in besieged areas in and around Damascus (and elsewhere) can reach to access medical care; in northern Afghanistan, where hundreds of people injured in current fighting are pouring into our trauma center in Kunduz; in the Domeez refugee camp in northern Iraq, where food vouchers were recently cut by two-thirds; and in Kenya, where Somali refugees face the threat of violence and forcible return. This crisis has rightly shocked the world. But the harrowing scenes we have all seen are not confined to Europe and the Middle East. More than 60 million people have been uprooted by conflict and chaos around the world today. From stateless Rohingyas fleeing persecution in Myanmar and adrift on the Andaman Sea, to families driven from their homes by wars in South Sudan and Central African Republic, to people escaping violence and extortion in Central America—we are witnessing a global crisis that is fundamentally challenging the willingness of the international community to uphold its moral responsibilities to other human beings. The United States has a proud tradition of welcoming refugees, and it has apportioned billions of dollars in aid and assistance to lands around the world affected by armed conflicts. But the United Nations High Commissioner for Refugees, Antonio Guterres, has urged the US and other attendees of the UN General Assembly in New York to do more, to play a greater, more active, and more compassionate role in the ongoing refugee and migrant crises in Europe, Africa, Asia, and North and Central America. What better backdrop than the world’s largest gathering of international leaders for the United States to once more offer additional humanitarian support for people struggling to find safety, increase the number of asylum claims it approves (including for civilians wounded or tortured in conflict), and further ease cumbersome refugee application processes so the most vulnerable can easily apply? President Obama: You took steps in this direction when you addressed the UN General Assembly this past Monday. But announcing an intent to accept a certain number of refugees falls far short of truly addressing the suffering faced by millions fleeing violence and oppression. More than simply living up to obligations as a signatory to the 1967 protocol on refugees—and its own proud history of providing shelter to millions of foreign-born men, women, and children—the United States should take additional actions to ensure hope, dignity, and humanitarian assistance for those uprooted by war and strife. A courageous, committed United States can once again rise to the occasion by making its voice heard, showing resolve, and joining the European states that have opened their borders to large numbers of people in need of refuge. By taking action and showing solidarity, the United States can reaffirm its commitment to refugees the world over and can set an example to other governments that have been unable to come to terms with the challenge at hand. This could be a step towards dismantling recently erected barriers to safe passage, which only drive those forced from their homes to take ever more dangerous routes in search of sanctuary. The United States should encourage UN member states to ensure that lifesaving and basic needs are met and that humanitarian appeals are fully funded, reversing the shortfalls and cutbacks that have sadly become the norm in humanitarian crises. Beyond this week’s meeting in New York, we hope America’s political leaders will commit themselves to once again placing the country at the heart of efforts to find solutions to this global crisis, as it was when past generations of immigrants and refugees found shelter and opportunity in this land. The United States can make an essential difference by ensuring safe passage for people driven from their homes and by working to make the need for their harrowing journeys obsolete. Doctors Without Borders has also encouraged European leaders to do more, and we readily admit that we do not have all the answers. But we see the medical and psychological consequences of the current situation, and we must bear witness to the tragic human impact of a global system that shuts out people seeking to escape violence, poverty, and misery—people who, like many Americans, past, present, and future, seek only a safe place for themselves and their families.